Ce document au format PDF 1.3 a été généré par Adobe InDesign CS4 (6.0) / Adobe PDF Library 9.0; modified using iText 4.2.0 by 1T3XT, et a été envoyé sur fichier-pdf.fr le 26/03/2019 à 21:39, depuis l'adresse IP 83.200.x.x. La présente page de téléchargement du fichier a été vue 73 fois. Taille du document: 760 Ko (12 pages). 1958 Frederiksberg, Copenhagen, Denmark, or at tml@life.ku.dk. N Engl J Med 2010;363:2102-13.
reached varied conclusions, probably owing to the fact that the studies had insufficient power. 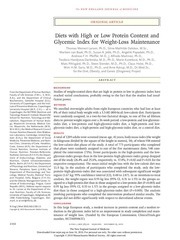 diets to prevent weight regain over a 26-week period: a low-protein and low-glycemicindex diet, a low-protein and high-glycemic-index diet, a high-protein and lowglycemic-index diet, a high-protein and high-glycemic-index diet, or a control diet. groups did not differ significantly with respect to diet-related adverse events. Downloaded from nejm.org on June 16, 2016. For personal use only. No other uses without permission. here the results of the 26-week weight-maintenance intervention phase of the study. and the statistical analysis plan. families are not reported here. (800 to 1000 kcal) per day. moderate protein content and did not include instructions to participants with respect to the glycemic index. Figure 1. 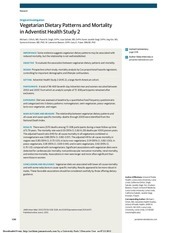 Screening, Randomization, and Follow-up of Study Participants. HGI denotes high glycemic index, HP high protein, LCD low-calorie diet, LGI low glycemic index, and LP low protein. during the first 6 weeks and monthly thereafter. the provision of food would have on adherence. designing the study or in analyzing and interpreting data. Sidak’s adjustment for multiple comparisons. between randomization and the end of the intervention. was analyzed with the use of a logistic model. use of SAS software, version 9.1.
low-calorie-diet phase and at the time of randomization were available. †	Fat mass and fat-free mass were assessed with the use of dual-energy x-ray absorptiometry or bioelectrical impedance analysis. matched with respect to characteristics at baseline 0.27 mmol per liter; P = 0.01). 95% CI, 0.48 to 1.00; P = 0.05). index groups (P&lt;0.001). There was a 71% (20.6-g- 2.54; 95% CI, 1.38 to 4.66; P = 0.003) (Table 3). *	Plus–minus values are means ±SD. Data on the change from screening to the end of the intervention (week 26) are shown for participants who provided a complete record of their dietary intake at both screening and week 26. Further details on dietary intake are provided in the Supplementary Appendix. †	To convert the values for kilojoules to kilocalories, multiply by 0.239.
and Changes in Body Weight. the basis of an intention-to-treat mixed-model analysis. high protein, LGI low glycemic index, and LP low protein. events, see the Supplementary Appendix). the time of randomization and the end of the trial intervention. effects were too subtle to be subjectively perceived or measured with the use of visual-analogue scales. a culture that supports these dietary changes. expected rate of 20%,11 possibly owing to difficulty in maintaining motivation in whole families over the course of the 26 weeks of the study. direct comparisons difficult. McMillan-Price et al. 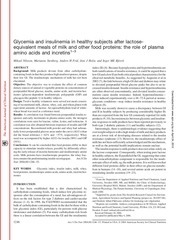 by 24 glycemic-index units.22 Philippou et al. weight loss in most studies of similar length. to be ideal for the prevention of weight regain. California, and Kraft; and receiving lecture fees from the Almond Board of California, Arla, Campina, and Astellas Pharma. conflict of interest relevant to this article was reported. the management of obesity and its comorbidities. Obes Rev 2009;10:36-50.
hoax or an effective tool for weight loss? Saltzman E. High-protein weight-loss diets: are they safe and do they work? A review of the experimental and epidemiologic data. Nutr Rev 2002;60:189-200. McMillan J. Glycemic index and obesity. Am J Clin Nutr 2002;76:281S-285S. diets consumed by free-living subjects. Eur J Clin Nutr 1997;51:667-72. 17. Gadbury GL, Coffey CS, Allison DB. 18. Miller M, Beach V, Sorkin JD, et al. C-reactive protein during weight maintenance. J Am Diet Assoc 2009;109:713-7. Obes Relat Metab Disord 1999;23:528-36.
about this policy, authors should feel free to call the Journal’s Editorial Offices. Ce fichier a été mis en ligne par un utilisateur du site. Identifiant unique du document: 01912897.